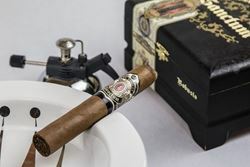 The Alec Bradley Sanctum was a project spearheaded by Alec Bradley Executive Vice President Ralph Montero and released in 2015. The name Sanctum is an homage to the amount of personal time it takes to enjoy a cigar. Sanctum has a multi-national blend, which is a calling card of Alec Bradley's cigars. This blend sports tobaccos from Costa Rica, Columbia, Honduras, and Nicaragua. The Honduran Corojo wrapper is the star of the show, bringing a unique earthiness to the cigar. Other flavors one should expect from the Sanctum are leather, dark chocolate, and black pepper.